Todd Swank: Delta Airlines. Are all your planes broken? Delta airlines needs to buy new planes. All of theirs appear to be broken. So let me tell you my story of the last two days traveling via the usually pretty good Delta Airlines. I was supposed to fly a quick trip from Minneapolis to Houston for a Nor-Tech customer event in conjunction with Intel at a Houston Rockets Game. My day started off at showing up to the airport about an hour and a half before my scheduled flight. I went through the security molestation check and was annoyed when told I now have to remove my belt to pass through the XRAY machines. I know this is no big deal for most people, but putting a belt on is a challenging task for a Shortarmguy and required me to make an immediate trip to the bathroom to remove my pants so I could put my belt back on. Otherwise, my pants were falling down while I walked through the airport. So I went in the bathroom and had the choice to pull my pants down in a dirty stall or out in the open in front of a group of strangers. I opted for thrilling the strangers, put my belt back on, and proceeded out of the bathroom straight to check the departures sign to find out which gate I had to go to for my flight. To my dismay, my flight wasn't listed on the board. So I stopped at the airport information desk and asked if he could figure out which gate I needed to find. He couldn't figure it out and then I remembered I had the Delta app on my iphone which luckily told me which gate to go to. I come to discover that my gate is about a mile away from where I'm standing so I needed to run to make sure I was there in time for boarding. I used to check my main suitcase and just carry my backpack through the airport, but since the airline robber barons started charging a $25 fee for the honor of putting my bag below the plane, I've joined the masses and now carry everything with me on the plane. Normally no big deal, but when I have to run a mile in 15 minutes, it adds to the fun. So I raced to my gate while nearly avoiding a heart attack and get there to discover they're not boarding yet. I told the lady behind the counter that our flight wasn't listed on the departures board and she looked at me like she could care less. 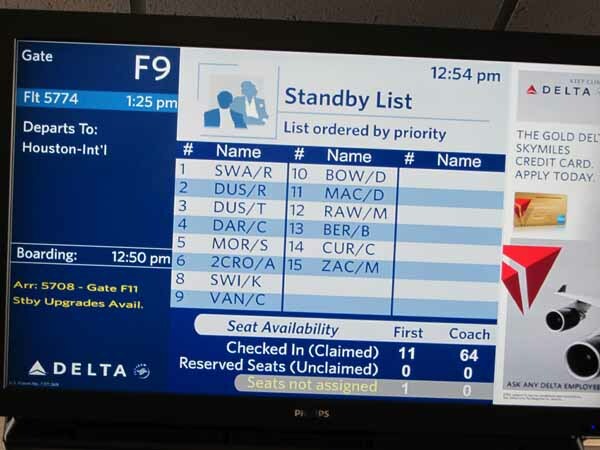 I then discover that my flight had been delayed but they hadn't bothered to change the status on the Delta app or even on the sign behind the counter. But I thought "No Big Deal. A delay will let me grab a bite to eat for breakfast and catch my breath." I go and quickly grab a mini Godfathers pizza and return to my gate to wait through what is supposed to be a short delay. It wasn't. At about 9:30am with the sign still reading that my flight was "On Time" with a 9:05 departure, the lady behind the counter proceeded to tell the huge line of people that our flight had been canceled. She told us to go way down the hall to the Delta information counter to receive instructions on what to do next. So I walked down there to discover a huge line of people. While waiting in line, I decided to call Delta reservations and figure out a plan. They told me there was another flight to Houston at 1:25PM that I could get on via standby. The flight was already oversold by 2 people and I was number 5 in standby. I said "There's no way I'm going to make it, so I guess I'm going to have to cancel my trip." I called my boss, Dr. Bollig, and explained the situation to him. He told me it was important that we be there and told me to risk the wait. I thought he was crazy, but respected his opinion and proceeded to have lunch and wait out this next unexpected delay. I arrived at the gate at about 12:25 and was told I was now at the top of the list for standby and the sign above me confirmed that fact. R. Todd Swank #1 on Standby! So I get on the plane and quickly lose the waiting anxiety as I discover we're flying directly over my house! 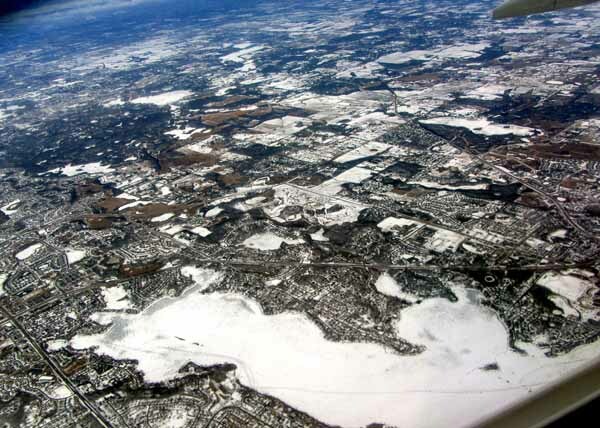 This is a picture of Prior Lake, Minnesota where I live. I thought that was a good sign and maybe things would get back on track for me on this trip. The flight was scheduled to arrive at 4:28pm and I needed to be to the game at 6 to pick up my tickets. A half hour cab ride, quick checkin to the hotel, fly up there to change clothes, and race to meet my contact who gave me the tickets outside of Toyota Center. I made it to the game on time and all could be good again. I had never been to an NBA game outside of Minnesota, but it seemed just like a Timberwolves game minus the Kevin Loves and the Ricky Rubios. I was at the game for about 4 hours and met a bunch of interesting people and had many interesting conversations. Life was good again. The game appeared to be a good one, but honestly I hardly watched any of it. 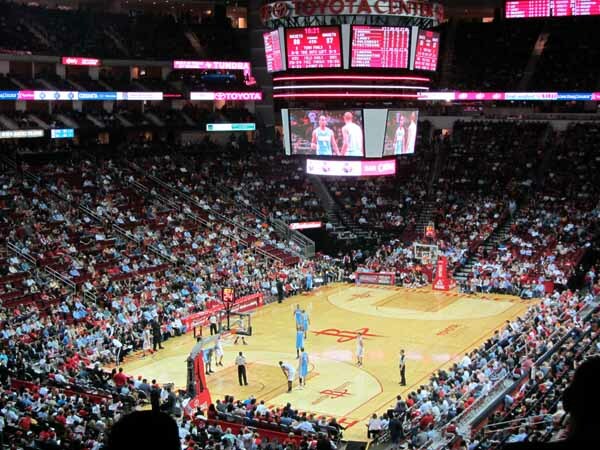 I could care less about either of these teams and I flew down to Houston to do some networking, not watch a game. 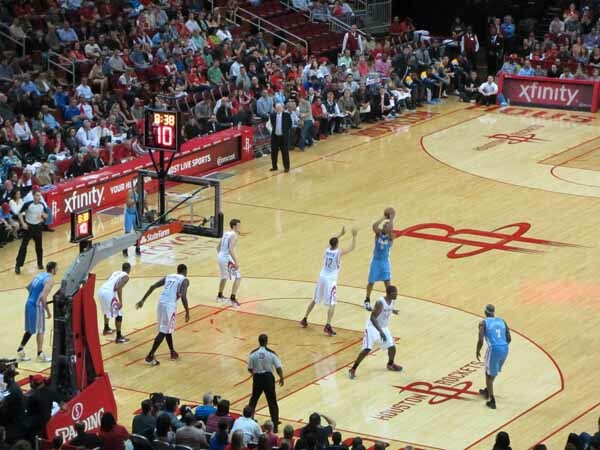 The Nuggets ended up beating the Rockets by 117 to 105. I also felt like a winner because I spent a few hours chit chatting with engineers and people with PHD's from the oil and gas business and I didn't come off as a total moron. At least I don't think I came off as a total moron. It's always tough to know for sure. 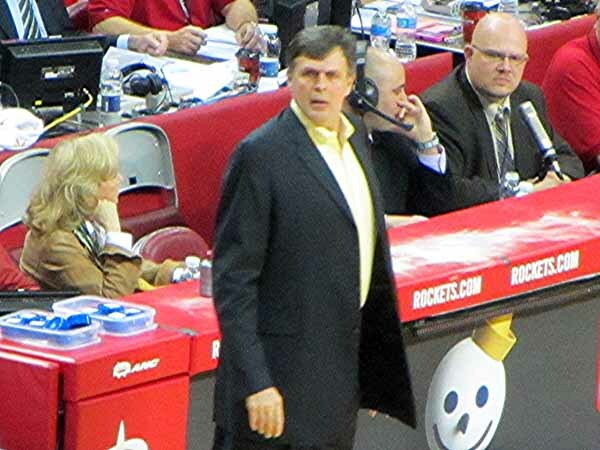 I wanted to go down and network with ex Minnesota Timberwolves General Manager and Coach, Kevin McHale, but he looked kind of busy so I didn't want to bother him. Basketball can be a pretty rough sport. But the pain is nothing like that of the pain felt being a Delta Airline's customer. So day 2 of my quick trip to Houston went like this. I woke up and left the hotel at about 10. My flight wasn't until 1:25, but I thought I could grab a bite to eat at the airport. Besides, I was getting pretty good at hanging out and waiting there. I ate breakfast and arrived at my gate at about noon. I was a bit surprised to see that my gate sign said the flight was to Salt Lake City at 11:05. The lady at the counter explained that the Salt Lake City flight had been delayed and they were moving those people to another gate so they could start to prepare for my flight back to Minneapolis. So as 1PM rolls around and I rest comfortably with the knowledge that the the sign behind the Delta counter says my flight is "On Time", I suddenly get surprised with the news that my flight has been delayed for 3 hours. I decide to remain calm and not do anything mainly because there's already a huge line waiting to talk to the lady at the counter. I continue reading my book. I then hear a young girl behind me on the phone talking to someone at Delta reservations. She says something about the fact that maintenance needed to replace extinguishers on the engine of our plane and we needed to wait for a part to arrive on another plane. I was OK with the thought of this. I don't know what extinguishers are on an airplane's engine, but if they need to be replaced then I want them replaced. But I started thinking, how long is it going to take to do something like this? I called Delta Reservations and asked if I had any other options. Lucky I did, because shortly after I reached someone on the phone, I received a text message from Delta that my flight had been canceled. The lady on the phone was nice, but let me know that I had no other options for a direct flight from Houston to Minneapolis. 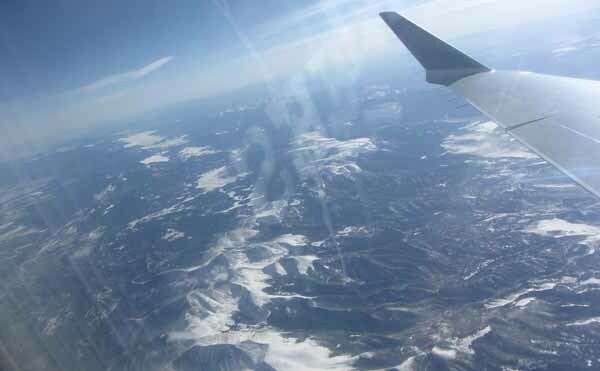 If I wanted to go home that night, I had to fly to Salt Lake City, Utah and then to Minneapolis which would get me home about 5 hours later than I originally had planned. Fine. I flew to Utah. I hadn't really expected to see any mountains on this trip, but they were very nice just the same. I ended up sitting next to the gal who I overheard discussing the extinguisher problems. We made a couple of jokes about our next flight in Utah being cancelled, but of course,that could never happen for real. Well, the laughing stopped when we landed and I received a text message from the Delta App telling me that my next flight had been cancelled. I now had to fly to LAX and take a redeye back to Minneapolis getting home at 6am the next morning. I couldn't believe my eyes and neither could the girl sitting next to me. She downloaded the Delta App which told her our next flight was already boarding and we had about 15 minutes to get there or get left behind. I figured the app was lying to me, grabbed my rolling suitcase and proceeded to run all away across the airport. Do I need to tell you that my gate was about a mile away and this time I had less than 15 minutes to get there? It was. We get there and discovered the Delta App absolutely was lying to me because they let me on this plane and finally I was heading back to Minneapolis! Shortly after getting buckled into my seat, the pilot gets on the intercom and apologies that we're going to be delayed while the maintenance crew makes some "Minor Repairs" at the rear of the plane. He's optimistic we'll still have an on time departure. 10 minutes later, he says they're not done yet and repeated his optimism. He then came on again about 10 minutes later and said his earlier optimism was unfounded as the cockpit checks weren't matching up with maintenance. Shortly afterwards the flight attendant suddenly stated the doors would be closing for departure. About 3 hours later, I was home. 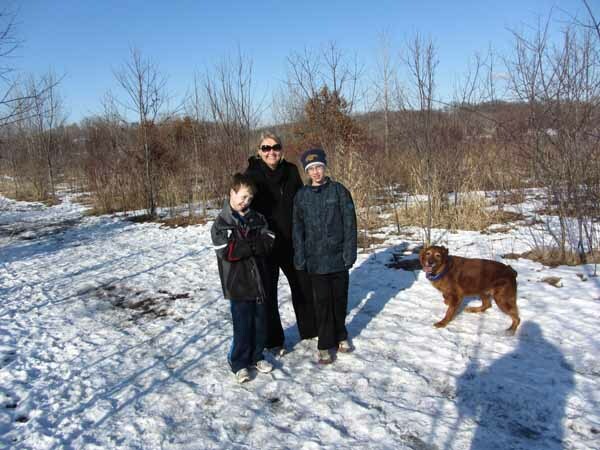 Because I was gone most of the weekend and the family didn't get to do much in my absense, I gave them a special treat on Sunday and took them to the dog park. Get used to it. I have a 2m+ sky miles with them through amex, and I've been purposefully flying with other airlines so I don't have to withstand the pain they put their customers through. Someone needs to euthanize that company and put it out of it's misery. Hi how are ya? First thing you should do is call ahead. ( 2hrs not 1.5. )2nd Dress so you can adapt to the situation. I.E. (don't wear a belt you can't take off). If your problems are a disabilty try the skycab. Not to mention 1 mile in 15 min is not that hard. 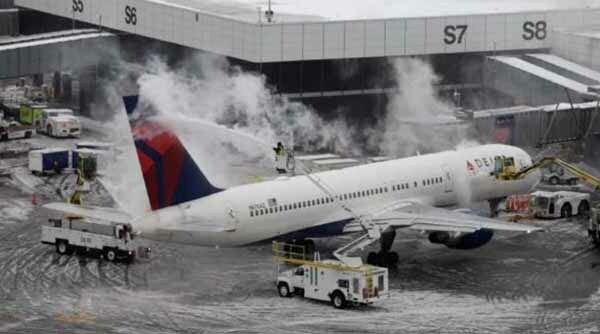 I would say in your 2nd picture the plane is being de iced for your safety. And please don't dicredid the hard working people of Delta or any other airlines.